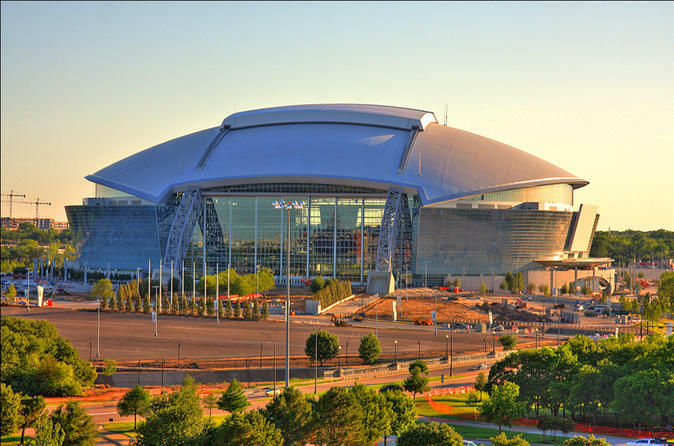 Embark on a 6.5-hour adventure of the Dallas and Cowboy Stadium. Enjoy a guided tour of the Dallas Cowboys’ new football stadium to witness the grand stadium, radio box, private suites, the Cotton Bowl offices, and much more. Explore the JFK memorial and Old Red Court House. This tour includes live commentary on board. Meet your guide at Platinum Parking, embark on your first adventure to the Dallas Stadium. Explore the Founders Plaza, Old Red Court House, John Neely Bryan Cabin and JFK memorial. Next, visit Pioneer Plaza (largest bronze collection in the world), Dallas City Hall (design by I.M. Pei), Thanks-Giving Square, and First Baptist Dallas Fountain Plaza. Afterwards, immerse into Deep Ellum, The Wilson Block (historic neighborhood, Queen Anne/Victorian Style Houses), The Art District (the largest in the world! ), Klyde Warren Park and The City of Highland Park (5th richest suburb in USA, home to many celebrities). Lastly, visit Uptown the McKinney Avenue restaurant district, West End, Dealey Plaza (JFK assassination Point) and much more. Next, explore the Cowboy Stadium with your friendly and professional guide. Enjoy a guided tour of the Dallas Cowboys’ new football stadium. This a huge new stadium built to impress everyone who enters it. With one of the largest video screens in a stadium today, the Cowboy Stadium is one of the most expensive sports venues ever built with estimated costs in the billions.Tour this grand stadium, the radio box, the press boxes, the private suites, the Cotton Bowl offices, Dr. Pepper Star Bar, and the Ford Motor Company Fountain. Each of these areas is sure to impress, but the real fun can begin when you walk onto the field. As you stand on the field and throw a ball, you’ll feel like a star. Then, just as the players do after a game, head to the locker room, the post-game interview room, and even see the infamous Dallas Cowboys’ Cheerleaders locker room. Enjoy an amazing three hour tour that will make you feel like a star.